50,000 steem? No problem! Say hello to Planet Slothicorn and the Rainbow Road! Hello hello hello... Can you hear me? I'm not sure.. I'm not sure if I'm coming through clear. This is CL.. This is CL and I wanted to give you an update on the status of things. Um... where we're at in the slothiverse so..
As you know, it's been several days since the daily art curation was ended. And we've taken some time to think and figure out and I have decided that I am going to build it back. I'm going to build back the daily art curation. As you know, slothicorn was born on a slice of pizza and it's main goals were to reward artists with crypto and teach artists how to use crypto and the daily art curation was the most direct way of doing that. It was just straight up giving steem to artists, just rewarding them for being awesome and amazing. It was a great project. Our delegation was in between 40,000 to 55,000 steem depending on when you checked so we're just going to call it 50,000 steem and we're going to embark on a journey together. We're going to do great things together. We're going to bring it back. We're going to get that 50k steem back embarking on this project Planet Slothicorn. We're going to make it to Planet Slothicorn. We're going to restore Planet Slothicorn. So if you're seeing this.. Hopefully you're hearing me and seeing me okay. I don't know if it's coming through clear. Hopefully you're at @planetslothicorn... the @planetslothicorn steemit is live. It's so live. So you can come hang out and you'll get my transmissions that I'm supposed to pass onto you there. And you might be asking "how are we going to get there?" or "how are we going to get to Planet Slothicorn?!". Well we know what our goal is. Our goal is 50k steem and we have a little tool that I've been working on to help us. Here we go. Here we are! So this is the beginning of the Rainbow Road. The first red square there.. even if you can't see it I'm going to tell you what it says. It says "art curation". So the art curation.. that's why we're all here. That's kind of how this big thing started and I think it's one of the best ways to fulfill our goals. So it is gone for now but not forgotten. We're going to restore it. 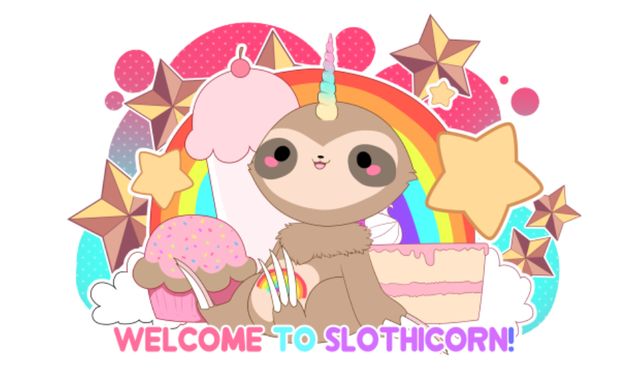 The second square on the Rainbow Road is the pink square and that's "Welcome 2 Slothy's". A little after the daily art curation started, our friend a. slothicorn spent some time with us, imparted a little wisdom for our busy times and share some amazing art so we can all see the amazing things other slothicorns are doing. And that's going to keep going. I have a feeling that's going to focus more on good advice and thoughts from a. slothicorn until such a time as the art curation is restored. And then this purple square, this next one, is "transmissions from planet slothicorn". So that's this. That's where we're at. We've already started on this way down to the Rainbow Road and you can see there's even an orange square and a yellow square that haven't been filled in yet that have blanks next to them. Those are top secret steps. Those are our next steps that I'm going to share with you in time. Projects that we're going to do to help us meet our goal of 50k steem. 50k is a great number. You know, I'll settle for something that is a reasoable reward for artists for curation but why not 50k. That's what we were at before. So, as it stands, it's my job to share with you the transmissions from Planet Slothicorn as I get them. I'm going to keep you updated. I'm going to let you know where we're at on this plan, on the Rainbow Road as we travel down our roadmap to making this happen. This is my transmission for the week.. For this week with @Drawingly's adorable art. We're going to keep the art involved here because that's what this is all about. So today, my goal was to let you know about Planet Slothicorn, let you know about the Rainbow Road which is going to guide us to restoring that 50k steem so that we can start our daily curation again, and let you know about the transition... the transmissions.. the transition to transmissions from Planet Slothicorn which will keep you updated on everything that is going on. I will be back next week probably... Whenever I get my next transmission to let you know where we're at, where we're going so that we can walk down this road together. And the last thing I have for you is the letter of the day. I'm just going to put it up here for you so you can see it. Alright but... You know if you know. You know if you know. Letter of the day. Awesome. This is CL signing off. I will be back next time with another transmission from Planet Slothicorn. Thank you very much! I could definitely use the help! Let's chat more! Is discord an okay place to chat more or do you prefer steemit? Wow! Very happy and excited about the future of slothicorn! how good they are back with us !!! I am excited about the future of slothicorn, and I'm so glad that you guys don't call it quit ^_^. This is so good! I'm so impressed! It is literally impossible to be angry while listening to that incredible Bit Quest music. Is there anything I can do to help with this? I'm so happy you're taking up the mantle and making it your own... I think an awesome little update is required in the 'What is Slothicorn?" page. Good call on the website. I'll have to update that next.! I am happy to hear you again and very excited about new slothicorn!